It was a mild day in January when I was born on the 21st, 1921 in a country home, which was also a general store, located midway two small towns, namely Augusta & Fall Creek, Wisconsin in the Township of Lincoln, Eau Claire County. A bit about my family: My grandfather, Julius Erdman, came over from Germany when he was three years old. He married Grandma when he was 25 years old. They started a country store in their home which they outgrew and built the place called Rosedale, which later became Rodell. It was a home and store combined. When my dad, Theophil, married my mother, Lola Klatt, they all lived together. 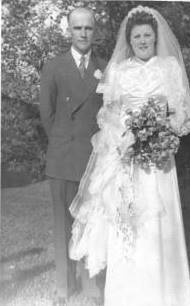 Mother and Dad had an instant marriage that lasted for 73 years. Mother and Dad met as attendants for a wedding. The groom was an uncle of mother’s and the bride an adopted sister of Dad’s. This took place January 24, 1920. Right after the ceremony Mother went home with Dad and stayed at his folks for 17 days. They were married Tuesday, February 10, 1920 at Pastor List’s home in Augusta. Mother came from a poor large family (6 brothers & 5 sisters), so Dad’s parents put on the wedding, including dressing the bride. Dad’s sister-in-law, Rose Erdman, made a small wedding cake, the photographer took their picture (no honeymoon). Only his parents and their attendants, Edger Erdman & Stella Klatt (Stelter), were present. They had horses and a sled for transportation. Very cold day (zero weather). When I was born we lived in a country brick home (built by my grandfather). It was a general store with living quarters. Five bedrooms upstairs with a kitchen, dining, living room, master bedroom and bathroom downstairs. It had a dance hall upstairs on top of part of the store. It was built with several carloads of brick (3 bricks thick). It had beautiful metal ceilings, all hardwood floors and trim, and a full basement. It had a freight elevator that went to all three floors. We were located one block from the railroad tracks. The store was first named Rosedale – later changed to Rodell. The freight at the depot of the railroad got mixed up with another by the same name located several miles down the line, thus the change. There was a dairy farm with lots of chores; plus a general store, machine shop, log sawing, welding forge, and custom harvesting. So it did keep everyone busy. A country school was located just across the tracks. A grain elevator and depot was located right on the tracks. Farmers brought their extra produce to the elevator which was loaded on the boxcars that were parked on the side tracks. Passengers could catch the coach train at the depot for transportation to the cities or town by waving a white hanky. My grandparents, (dad’s parents), and retarded uncle, Alfred, lived with us until I was eight years old. We also farmed with a dairy herd that was milked by hand. We had a cream separator which took the cream from the milk that was sold to the creamery. The skim milk was used for calf & hog feed. We had a large metal shed where farm machinery was assembled for sale. It was shipped in large wooden crates by railroad. My dad had a sawmill powered by tractor that made logs into lumber. The farmers would bring their logs to be milled in early Spring before the field work would begin. In the wintertime my dad would haul logs home from a woodlot he owned about ten miles away. Everything was done with horses. He also filled the ice house with ice cakes which were cut from the Dells Pond about two miles away. It was packed with the sawdust from the sawmill for use in the ice box in the store that had pop, near beer, cheese, etc. We had all kinds of groceries, canned goods, clothing, coffee grinder, confectionery, essential staples, kerose ne, gasoline, oil, small tools, hardware, machinery parts; everything a small country general store would have. The farmers brought in their eggs, trading for goods they needed. We had a one egg candler to cull out the bad eggs. I sat at it for many hours. We had a Delco plant which generated electricity to have lights which was about all it handled – not many other small appliances were used. We also had a wind charger which saved gas when the wind blew, otherwise it had to be charged with a gas engine. The tractors had steel lugs and steel wheels which made for hard steering and slow moving over dirt and muddy roads. Dad moved from farmer to farmer to do the harvesting and all the farmers would help each other. They came with their teams of horses, wagons and pitchforks. The women cooked scrumptious meals for the working crew. It was always a great time for all which they all looked forward to. We had a Model T sedan for our transportation on Sundays to go to church and to Grandma’s (mother’s parents, Klatts) house. We had a Model T flat bed truck for hauling freight when the weather permitted-otherwise it would be a team of horses. We had four draft horses; a black pair, Beauty & Frank (blind) and a younger red pair of sorrels, Dolly & Molly. We had a hen house with laying hens and pig house with brood sows-raising pigs and having our own butchering hogs for pork, also raise our own beef. We made our own bologna, canned beef, ham, bacon and fried down pork kept in large stone jars. We rendered our own lard. We always had a large vegetable garden and fruit trees, grape vines, raspberry bushes and strawberry beds. We had lots of wild berries, hazelnut bushes. It all was preserved for winter food. We had a wood cook stove to cook and bake at all times. If it got too hot we also had a kerosene range. The store and home was heated with a wood furnace on real cold days, otherwise a parlor stove was used that also burned wood. We burned a lot of used railroad ties in the furnace. The wood would be put in the basement thru a coal chute and piled up along the walls. The hot water was heated in a boiler which hung in the bathroom that was heated by the kitchen stove. Yes, we had running water from a shallow well pump that went into a large storage tank under pressure in the basement. We had a powered washing machine. Stationary tubs lined the wall with three compartments with hot and cold faucets and drains with stoppers. The white clothes were usually boiled in a copper wash boiler on a stove nearby for this purpose. Also we had a hand stomper for a lot of hand washing. In the winter or bad weather we had clotheslines in the basement, otherwise they were hung outside on lines. My grandparents (dad’s folks), Julius & Clara Erdman, purchased a home in Fall Creek where they moved in 1928. A short time later I got a baby brother, Alvin. I had a sister, Inez, three years younger than I. We were almost always together. We went to the Rodell country school thru the eighth grade when I started high school in Fall Creek staying with my grandparents the freshman year. I also had to attend confirmation instructions after school getting confirmed the next Spring. My sophomore year until I graduated in 1939, I went to Augusta High School. I had to room and board in town, there were no school buses. I loved all sports. We had a kittenball team at Rodell school which my position was on first base. The boys and girls played together on the teams. We would challenge our neighborhood country schools in games. I did a lot of skiing. We would be pulled with an old pickup truck down the snow filled country roads. We would make ski jumps on a hill nearby – ski down the jump and walk back up the hill. My cousins and I would have a fun afternoon on a nice Winter day. We would have sleigh rides – one of the neighbors would hitch his team to a big farm sleigh and some of us would toboggan, ski, or bobsled behind. Sometimes we would go to the Dells Pond to ice skate on a nice moonlight evening and come home to hot chocolate and cookies, ready for a good night’s sleep. My dad built my first tricycle. He used baby buggy wheels, one large for the front wheel & two smaller ones for the rear with a wooden seat, metal handlebars and pedals. Yes, he had a forge for heating metal and an anvil to shape it on. He was a very handy man (blacksmith). He made us a back yard playground with merry-go-round, teeter totter, a long chain link swing; a shed to play anty-over and enough room to have a ball game. We had a pump by the back screened in porch. Along side of it was a lily pond near a rural mailbox that was fastened up on a wagon wheel with two of our neighbors’ boxes on it. In the wintertime our mailman (Bert Herrick) would deliver in his snowmobile (yes, they had them back then). It was a Model T with skis for the front wheels. In the Spring he would have to have chains on in order to get thru some of the muddy roads and most of the time he needed horses to get pulled thru. Sometimes he would come in the store to purchase a nickels worth of wintergreen mints (a good sized bag full) to treat the kids on his route. My dad and two of his brothers were musicians. Dad could play the mandolin, violin, concertina, accordion, juice harp – his brothers played banjos. There were many evenings when the neighbors would gather at the store, maybe bring their instruments and play a lot of those old time polkas, waltz’s and charlestons. My grandmother taught me to dance almost as soon as I walked. She was a great dancer. Grandpa didn’t dance, he was the singer, singing all those old fashioned tunes and hymns. I took a few piano lessons from the neighbor lady so I would have to practice in mornings before school and my grandpa would sing the hymns. Highway 12 was built in 1929 along the railroad tracks passed our place. It was the same year my folks bought a new Model A Ford town sedan. It was sort of a rare thing to have a new car those days. We always had plenty to eat and nice clothes to wear. I had a pair of Sunday shoes and a pair for every day, in summer we went bare-footed. I had a couple of good Sunday dresses and several everyday ones, most of which were homemade. Being the oldest granddaughter, my grandmother would buy me a dress for special occasions of which I would be so proud and took very good care of. My dad was also quite a photographer. He had a camera that took postcard size pictures, which he developed and made extra prints of so we had many pictures. Special pictures would be taken by the studio. I spent most of my time with my dad setting up machines and handing him tools, after doing our kitchen chores my sister and I changed off washing & wiping dishes, sweeping floors and scouring the hand sink. My dad never spanked me, never laid a hand on me. My mother had to do all the punishing. While the highway was being built, my mother would feed the laborers their meals. Those days would be nothing but cooking, baking and washing dishes. The men slept in bunks in sleeping cars but they didn’t have a cook shanty close by. I would have to sit by the desk at the door, as they came in they would register so the company knew how many meals to pay for (approx. 50¢ per meal). One weekend when the crew was gone, my neighbor girlfriend and I went to investigate a bridge they were building over the creek. I was forbidden not to go near there so when I got back home my mother was looking for me with a willow switch so you know I got punished. She chased me around the yard until she was almost breathless so I stopped running away from her and took the licking. The schoolteacher boarded at the farm homes and many times would stay with us as we had five bedrooms in our upstairs. On one occasion we had a teacher (Naomi Steen) as our guest. The next morning she came tumbling down the stairs – luckily she didn’t get hurt but she had to take a lot of razzing. I always carried my lunch to school so as not to miss a minute of the noon hour in order to play ball or whatever, unless my mother didn’t have it ready. We had outdoor biffies at our country school. We were modern enough to have a basement with a furnace – it had a big round register above it which supplied the heat for the room. We had a water hand pump outside and a big earthen jar with a fountain on it to drink from with a bucket under it to catch the wastewater. We had a sink with a wash basin in it and paper towels – all located in a hallway entrance to the classroom. Every week we took turns for duties such as put up the flag, empty wastewater, sweep floor, wash blackboard, pound erasers, empty waste basket, put wood in stove, take out ashes, sweep toilets, in the Fall everyone raked leaves and picked up trash. Everyone walked to school no matter how far. I never missed a day of school except for the quarantine when my sister had the chicken pox. (Believe me, I didn’t want to). One day in mid-winter when I was in the second grade we had a real old fashioned blizzard. There were only 2 others besides me in school that day. My dad came to get me walking thru blowing, blinding snow up to his hips carrying me piggyback. I don’t remember how the other two students got home but they made it. They lived close to the school (Bernadean Wolfgang and Lorain Schroeder). It would not be unusual for the snowbanks along the road to be up to the telephone lines (they were strung on poles those days). They would use big Caterpillars to plow and maybe not even make it. We wore woolen clothing, knitted stockings, caps, mittens and wore flannel drop seat long underwear (which we hated), wool skirts and knitted sweaters (girls didn’t wear slacks or have snowsuits). I would have to carry wood up from the basement and fill the woodbox every evening for the next days fire. One day the freight train was parked on the side-track so the dispatcher called on the phone, he told my mother to get word to the engineer he was to take off, so I was sent with a note. The guys took me up into the engine showing me how everything worked and dug in their pockets and gave me a dime and some nickels. It made my day. Several times the train would be blocking the road across the tracks and we wouldn’t want to wait until they got out of the way so the brakeman would guide us thru between the cars in order to get to school within a few minutes so not to waste the precious times for our ball practice or whatever. You see I liked school and my many good teachers. We had those old fashioned Christmas programs when we all had to learn a part in a play or a dialogue or a poem which was always an exciting evening for us all. Santa came with goodies and we exchanged names for a small gift to give. I still have a little egg beater and bowl which I received in the fifth grade. We would have basket socials, Valentine parties, etc. My dad served on the school board several years. They would have their meetings and social hours several times a school year. The women would help houseclean the schoolroom, paint; repairs would be done by the men. A lot of volunteer work was done – saved money which wasn’t much of. I would stay with my grandparents six weeks during vacation to go to summer school (religious training). The minister from our church (Rev. Jule Bittner) would teach us the small Catechism which was learned by heart. The first year I learned it in German, which was a new language from our German brogue we were used to speaking. We talked this Low German until I started school so there were many pictures of subjects I couldn’t say in English. We attended classes until noon, when we would race (I was the fastest runner) to the post office, pick up the mail and grandma would have dinner ready. I’d help with the dishes and then went to play with the neighbor girls (Gretchen Voechting & Freda Baumbach). We had miniature golf & croquet, played touch football with neighbor boys. We went roller skating, always near grandma’s house, sometimes played in a custom built playhouse that Freda had. We always had a good time. In the evening it was a hard study time learning the Catechism verses for the next morning class. We had a very strict teacher. While in class we would have to go upstairs, almost every day, by the organ to sing a hymn we had learned and when my partner (we had double desks and folding chairs for seats way in the back row) and I came back I would find our folding chairs laying on the floor. We got fed up with this happening all the time so one time we decided to take our time getting back so the minister saw what had happened and he asked Verna and I, her brother, Marvin, Ben Schiefelbein, and Victor Bittner stay after. So he pulled off his belt and gave Marvin a few belts with it. After that we had no more problems, (I guess the rest of us were witnesses, I was too scared to really know). I had a special friend in my freshman year (Gwendolyn Zemple). Her dad had a dairy that delivered milk in town. He had a horse driven vehicle with bottled milk which went from door to door. I spent lots of nights over to their farm and her dad took us to school in this vehicle in the morning so we wouldn’t have to walk. Other times she spent nights with me at grandma’s house in town. At the end of the freshman year I got confirmed. It was always a celebration when this happens. Relatives and friends were invited over for a big dinner and afternoon lunch. The gas pump was the type where you had to pump the gas up into a glass tank with the gallons marked on it, so the customer could buy the number of gallons he wanted. Those days it sold for 5 gallons for $1.00 or .98¢. The kerosene was in a big tank in the closet which we pumped up into a gallon container which was poured into the customer’s container. The vinegar barrel had a wooden spigot which when opened let it run into the gallon jug the customer brought in. The coffee beans were put into a coffee grinder which we turned by hand – only one grind called “5 o’clock” brand was the popular one. Plug tobacco was very popular. The customer could get the amount he wanted by a cutter that cut off the marked amount, which they used for chewing. Smoking tobacco was also a good seller and cigarette papers for rolling your own. Cigarettes were in the popular brands being Lucky Strike, Camel, Wings, Chesterfield, Marvel and Philip Morris selling for about .15¢ a pack or 2 for 25¢. I worked in the store many times after school, on weekends and during the summer. The store would be closed on Sundays. We spent many Sundays with my mother’s folks. She had six brothers and five sisters. Two of my aunts were around my age, in fact Viola was several months younger than I and Hulda was about a year older so we were very good pals. They lived on a farm north of Fall Creek on the corner of K and Q. They had a log house for a chicken coop, also a big barn. They had an open well for their water supply. It was a bucket on a rope which was lowered down the well shaft til it hit the water, when filled up you pulled it up on a pulley and emptied the water into your vessel. Us kids used to fill the wash boiler for Monday wash day and filled the horses watering trough. They had geese, turkeys and chickens, milking cows and horses; raised their beef and pork. They once had a very high fence down by the creek where they raised commercial giant frogs for frog legs in restaurants. We spent a lot of time in a wooded area right by their house – making rooms of the dirt for our own playhouse. We did a lot of make believe. They had no running water, electricity, or telephone. We had to watch for the hissing geese that would come after us when we went to the outhouse. On our way over to grandma’s house we had to cross a big wooden and iron bridge. You came to a curve in the road and went down this grade over the bridge which made a lot of noise, the planks and steel rattling and had to take speed to make the hill on the other side. I hated crossing it so much I used to lay down on the back seat of the Model T with the round window in the back and cover my eyes hoping we’d make it over. We would always take a treat for our aunts and uncles from the store, a bag of candy and gum. They always looked forward to it and appreciated it very much as they only had the bare necessities of life. One time we hadn’t been there very long, we were upstairs playing. We jumped from the high bedstead unto the bed, when it was my turn I jumped and my foot went thru a windowpane breaking the glass to bits. We calmed down after that and played more quiet games – like putting on makeup, high heels, and hats. We had a creek running thru our farm not far from the house. We would spend some time fishing shiners and chubs in the deeper holes. We didn’t eat many fish from it. I don’t think my mother appreciated those few little fish we caught. We picked more blood suckers off each other after wading in the creek. It wasn’t deep enough to swim in where we were allowed to go so I never learned to swim. Once when it was deep enough my mother was in a boat stuck on the side of the bank so she gave it a push and fell into the creek. We thought it a big joke. We used to net minnows to use as bait for the big river fishing. In the spring we’d eat a lot of redhorse and suckers fried, pickled, or smoked. We had a telephone that was a big wooden box with a mouthpiece, a receiver and a crank. All the neighbors were on the same line so the rings for each one was different, for instance our number was 22 so it meant our ring was two long and two short _____ _____ __ __, but everyone else on the line would hear it ring so you could listen in on the conversation – sometimes really interesting especially if it was a young lady and a hired man. It seems most every farmer had a hired hand. I had a great uncle that made us a radio. It was a box with three knobs on it that would squeak and squack until you got it tuned in right. It had a big horn on the side where the sound came through. When something special was on – the neighbors would come over and listen. It was one of the first in the neighborhood. Salted peanut shucks would be all over the floor. The cuspidor would be a mess – but the sweeping compound always cleaned the dark oiled hardwood flooring of the store. Candy wrappers and empty pop bottles were also common. We all spent a whole day at Wisconsin Dells, took both upper and lower boat trips. It was one of the highlights of the summer. My Grandfather Erdman had his way of doing things, like a Jew would do. As each son got married, every one of the others pitched in to build a house on the acreage that grandpa gave him. His oldest son, Ervin, had a fox and mink ranch. His other sons each farmed. They built a barn and had barn dances which the cover charge was 99¢ and 1¢ war tax to pay for it. The youngest son lived with his folks until they died – then he lived alone until he had to go to a nursing home. One of my uncles, Edgar (dad’s brother) lived with us with his new bride (Rosella Herrick) while the house was being built. In the meantime our minister came out with his family to give her Confirmation instructions which took a few weeks. The minister’s boys and girl usually played around the barn swinging on the hay rope that hung in the driveway of the hay barn. They were sort of hellions, always wanting to do something we weren’t supposed to. Another uncle, Herman, after being married for sometime, got divorced by his wife, Amanda. He wasn’t much of a farmer or a good manager. He got mixed up in horse jockeying and lost. One day my grandpa was waiting on a store customer who wanted a pound of prunes (they came in bulk). He would put another prune on the scale, it would go over the pound mark – he’d take it off and it would go under so he bit the prune in two to make it an even pound. This is the story of how he got his name as Prune Jul. Believe it or not. (He was sort of a tight wad but grandma made up for it). I remember grandpa sitting by the desk most of the day writing checks to pay bills, balancing the bank account – you usually could tell when things were going well and when not. It seems every evening meal was always eaten without grandpa. He always had to feed the pigs at that time. My sister and I would get angry trying to keep his supper warm and him holding us up with getting the dishes done. One evening we had fresh garden peas that were fixed in milk and butter. He remarked “these oysters seem to have a lot of sand in them”. My sister and I just giggled and said nothing. My sister Inez didn’t seem to be the healthiest when she was a child. She had a ruptured appendix – a very sick child, in the hospital for quite a spell. She had us all worried for a while. I had my appendix out when I was seven but it was nothing for me. Inez also had adenoids and tonsils removed and seemed she’d catch every contagious disease that came along. One afternoon or evening we went visiting over to my cousins – we were hardly there (less than ½ hour) and we were playing on the front steps that had high cement sides so we would stand on the sides and jump off, when it came my turn I broke my leg or rather splintered it so I had a cast on it for a long many weeks – remember crawling around with that uncomfortable thing on. When my kid brother, Alvin, came along we had to do a lot of brother watching (didn’t call it baby sitting). We were supposed to show good examples for him which meant behave yourself so he doesn’t also do those naughty things. He was most always good, if he wasn’t I’d get the blame. We had a naughty kid cousin the same age as Alvin. When he’d come over we’d hide my brother’s toys so they wouldn’t get broken. One time when the family came over my cousin bit me on the arm (this had happened many times before) so I slapped his mouth. He run to his mother bawling that I’d hit him. I went and hid thinking I’d probably get punished for it but I didn’t. After that he was a good cousin, never bothered me again. We always had an old fashioned Christmas. Dad would bring home a pine tree from the woods and on Christmas Eve Santa came and trimmed the tree and left our gifts. We had real candles that were lit Christmas Day night with very careful supervision. We would attend our church Christmas program on Christmas Eve which I participated in until I was confirmed. We had an orchestra to sing to. It was always a most pleasant evening. Christmas morning we’d be up early to see what Santa left. We’d probably go to church and have a real old fashioned Christmas dinner – a turkey or goose with all the trimmings. At Easter we would find a nest in the corner of the bedroom, usually consisting of a new handmade dress, maybe patent leather shoes and Easter eggs. We’d attend church and have a big Easter dinner, either at home or at one of the grandma’s. Now that Spring was here it was house cleaning time. The carpets would be taken up, hung on the clothesline and slapped with a broom or carpet beater. The curtains or draperies, windows, walls and ceilings would be scrubbed. The hardwood floors were always scrubbed almost white which now would get a new coat of varnish as would the woodwork around the windows, doors and mopboards. Summertime was always a busy time and fun time. We always seemed to have a lot of company. We would make ice cream in a bucket of ice with a hand crank. It was always rich and creamy and tasted so good, a real treat for everyone. We would do it with a churn outdoors by the pump where we washed the sawdust off the ice cakes and chipped it to fit into the bucket sprinkled with real coarse salt. When the circus came to town the advertisers would plaster big paper signs on the side of the old shed facing the highway and give us free tickets so we always got to go to the big Ringling Bros. Circus on the southeast side of Eau Claire which was then just a field of sand burrs and weeds. Sometimes we even got to watch them set it up the day before it was opened which was interesting to see the elephants put up the big tent and the men pounding the stakes. They made fast work of it. One summer we had motion pictures shown on the side of our tin shed. Every one gathered around, either they sat on the ground or some benches that were rigged up with planks and blocks. When the sun went down they started and lasted a couple of hours. It was quite a treat for the neighbors. We went to Rib Mtn. several times for a picnic with our relatives who lived in Wausau and Marathon. We’d fill a wash boiler full of picnic food and tie it on the front bumper of the car. One time we visited at my great aunts who was redecorating her house so she had a bushel of odds and end dishes, which she had my sister and I pick out one. We each got a carnival dish (it is the vintage of 1908). I still hold mine very dear. My dad built several rabbit pens, they had chicken wire all around so the rabbits could eat grass – as they ate, the pens were moved to another grassy spot. We raised a bunch of domestic rabbits which were butchered when they weighed between 3 & 4 lbs. They made very good fryers. The older ones and heavier ones were baked, maybe in cream. Delicious! We would get little chicks in the mail – the mailman delivered them in boxes with coin sized holes in the tops. If it was early in the spring and still cold Mother would put newspapers on the floor in our pantry – kept them in the house for a day or so until the outside pen was ready for them – a kerosene heater supplied the warmth. Sometimes we would set some hens on fertile eggs and have her hatch them. These old clucks would get mean – they could peck one pretty hard if they were disturbed. Dad was scalded by hot steam that blew off the radiator of a Samson tractor. The tractor & clover huller was almost his head high so the whole front of his chest and arms were burned. He still has a scar on his left forearm. It needed skin graft but it never was done. My sister and I used to look forward to the time our dad would take us to the big city of Eau Claire to pick up supplies for the store. We rode in our red flatbed International truck. When he got his business taken care of (Hobbs Supply Co.), he would give us a few dimes and go with us to the Five & Ten Cent Store. It was a big day for us girls. Some winters we had large piles of slabs that was cut from the lumber that would be sawed into stove widths for firewood. We would pile that in the basement for winter heat with the other good wood. I went to have piano lessons to a country neighbor woman (Mrs. Ivis Roles). My next door neighbor friend and I would usually go. Violet would ride her horse. We both rode or else we would change off riding on a sled or skis in the wintertime. I took lessons for one year or less – it wasn’t my bag, I’d rather play ball. My grandpa would have me play several hymns and he would sing, usually in the morning when I was in a hurry to go to school. We had a Bull Terrior dog – black & white, named Fanny, for a house dog for many years. We also had a German Shepherd gray & white dog named Queen. She was a very good watch dog. No strangers could touch my sister or I without her putting up a fuss. One year she had thirteen puppies (it must have been some kind of record). She only had 10 feeding stations so my dad got rid of most of them. We had all kinds of barn cats. They would sit up on their haunches and drink milk as it was squirted to them right from the cow. My grandma was always baking bread, kucken, and lots of cookies. She was a very good cook. She loved having people over for dinner. She had a Model A car which she drove from town to the farm, (glad there never was much traffic). In my freshman year at Fall Creek, we had a football coach who also taught history. He liked to tease us bashful girls. He said there was a tie between Harriet and I for blushing. One day in class he came up with the phrase, “Give me Liberty or give me death”, who said that Lawrence, Lawrence in a half daze said “I didn’t, I didn’t”. We all had a big laugh, but he was always trying to catch us off guard. My grandmother had a neighbor who worked in the Fall Creek bank. He was a big teaser for us girls including his own daughter, Gretchen, always running after us and threatened to stick our heads in the rain barrel if he caught us. My dad would come and get me on Friday eves or Saturday morn to spend the weekend at home. Sometimes I’d ride the passenger train from Fall Creek to Rodell. Saturday nights was town night like Friday night is now. I didn’t take in too many of these nights – we were usually busy in our own store all weekend. We played miniature golf and croquet along side of their house right between grandma’s and theirs. Grandma always had a big garden with many vegetables and many, many flowers – gladiolas and peonies. We would roller skate on all of the sidewalks around the neighborhood. I can’t ever remember grandmother or grandpa ever scolding me. I started my sophomore year at Augusta High School. I roomed and boarded with a dear old lady (Mrs. Greene) with another girl (Rachel). We had a long walk to school way across town. We walked home for lunch. In the evening after we had our homework done, if we had any, we went down town and hung around with all the other kids at the Horton Café or took in a show at the Joylin Theatre (located where the post office is now). At the end of my junior year I went to live with another family to work for my room and board. They had a nine year old daughter, Sheila, who I baby sat. For her entertainment I think we went to every movie that came to town – about 3 times a week. Fred Balliett, the man of the house, was a rural mail carrier so he always gave us a ride to school in the morning after having his breakfast. He got up early to go to the post office to sort the mail. I helped hang up clothes when we washed or ironed clothes – washed dishes before leaving for school, helped with the evening meal – with cleaning, dusting, etc., any kind of light house work and do some baking. We would have several school dances during the semester. Our own classmates furnished the music. Brooks Arries played the guitar with a mouth organ fastened to it. I was busy teaching my classmates how to dance. Norm named one dance “The Do Flinkey”, it was supposed to be a waltz, 1-2-3. I was always helping some of the boys (mostly football players) with their school work or they might not have made it (the team). The Junior Prom was always the highlight of the year. I went with Jim, a classmate. We were only friends. He came out home a few times during the summer with his Model T. We went to the Chippewa Fair with some other kids, rode around in his car with the top down. I attended most all the basketball games, all the football games. I played girls basketball and softball. Senior year was a busy year for us. I was still working for my room and board at Balliett’s. I enjoyed home economics II. I made a three piece wool suit with a coat. It took first place. Several of us girls with our chaperone (Miss Hill) went to the cities where we had a ride on the Hiawatha passenger train from Minneapolis to St. Paul where we visited the capitol, went up the Foshay Tower, saw Zedric Adams broadcast the news over the radio, and some other points of interest which I’ve forgotten. I met the man I married in church at a wedding. He took two of my girlfriends and I to the shivaree in the evening and later took me to a movie. We saw each other after that about once a week or two weeks. We went roller skating and to a lot of movies and dances, go for Sunday drives with our friends. Clayton Bauch was the man for me! At graduation we had a dinner party at our house which all the relatives attended. I went to work at our old superintendent’s (MacLachlan) house. They had a son who was scalded in a kitchen accident when he was a baby, so I took care of him, taking him out in his buggy after I had the household chores done. I also did most of the cooking for 6 people, which my boss, Mac, really appreciated because his wife was a poor one. I earned $3 a week with room and board. I worked there until my grandfather Erdman died. I used that for an excuse to go home for a while. During the next winter I worked at Balliett’s off & on. I really didn’t want to work steady. I wanted to spend my last year before I got married with my folks. I did a lot of sewing, embroidering – getting things in my hope chest. Clayton and I were engaged at Christmas but we didn’t want to marry until we were more financially situated so I worked a lot of the time and we tried to save all we could. I and mother made my wedding dress (slipper satin) and I had a crown of seed pearls and long train for my veil. 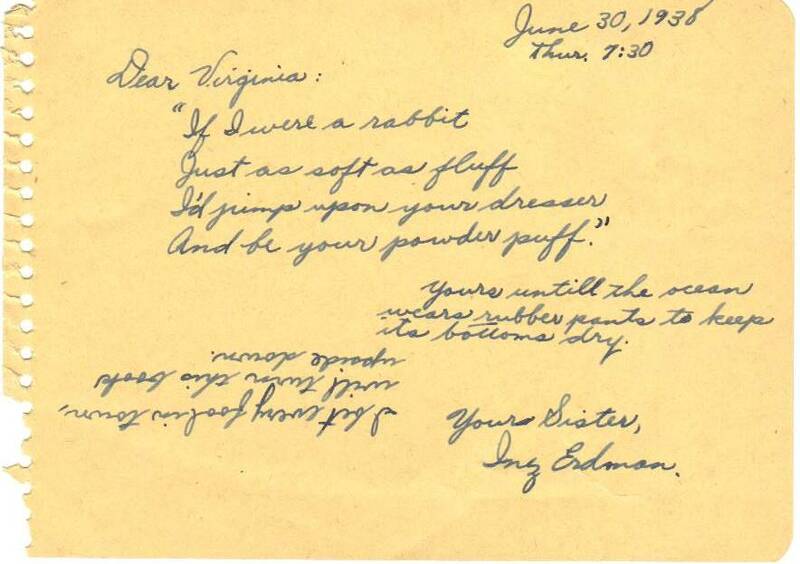 It was a very simple wedding in church (June 8, 1941). Grandma baked & cooked everything. We had a reception in the dance hall above the store – had a shivaree and dance. We had four attendants, all the relatives as guests. We went on a honeymoon to Marshfield & Rhinelander. At the shivaree they had kegs of beer and my Uncle Herb was passing around homemade dandelion wine – he’d fill a little glass and offer it to someone – if he didn’t take it – Herb drank it – so by the end of the evening he was getting a little wobbly on his feet. They said he was drunk for 3 days – every time he had a drink of water. We lived in an apartment in the front of a big house on a farm owned by the Emanuel Bros, which we had furnished with our earnings. Clayton and his father were hired men. His folks lived in the back part of the house. We worked there until the next fall. 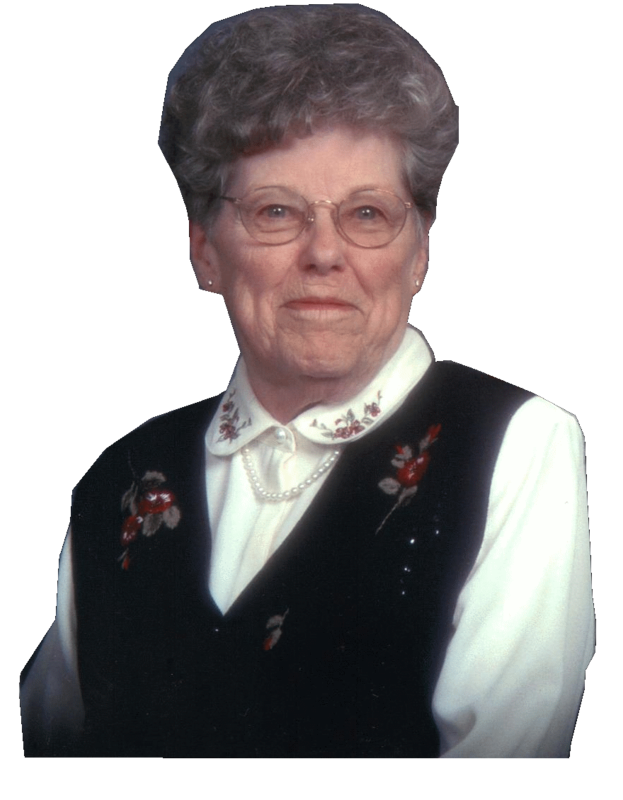 Kay was born on May 18, 1942 – we moved to Eau Claire and rented an upstairs apartment. Clayton worked at Drummond Packing Plant and I worked at Presto Plant. Clayton’s niece, who lived only a few blocks away, baby sat for Kay. We bought a house in Augusta on the north side which we rented out while we lived in Eau Claire; but then decided it was rather foolish not to live in your own home so we moved to Augusta. I quit work and Clayton drove with four other guys who rode with him. The riders helped pay for our cars. Dean was born March 17, 1945. We had a small barn, chicken house and woodshed. We bought ten acres across the street which we used for pasture and raised corn for the livestock we had. We had up to six Jersey cows and a flock of chickens. We sold milk to the neighbors who brought their own containers. We had Alyce on May 31, 1947. We didn’t use all of the house so we rented out part of it to people named Aken’s. They were desperate for a place to live when they came to Augusta. He ran a welding shop. They had a boy and girl and were wonderful people and we became very good friends. They finally got moved across the street because we were getting sort of crowded with the kids growing up. Dean had a pet dog, a Rat Terrier. In fact, we were outgrowing everything, the barn was crowded and Clayton always wanted to farm for himself. So we bought 80 acres out in the country from Ray Harke for $4,500. We sold the house in town for $3,000. The kids had to go to a country school, Diamond Valley, which they walked to most all of the time. Clayton still went to work at Drummond’s every day, so I did most of the chores-milked cows, fed them, fed calves, cleaned barns, do milk dishes with no hot or cold running water. I fed the pigs, chopped wood and carried it to the back porch, fed chickens, gathered and cleaned eggs. The eggs had a very good price (.80¢ a dozen), which paid the electric bill and bought groceries for a while until they went down in price. The twins, David & Dennis, were born on May 6, 1951, when we lived here. We had no running water in the house. I had a hired maid to help me with all the work a few days before they came and for several weeks after. In 1953 when we lived up on Gregor Hill Mom brought the old panel truck and the twins to pick us (Kay, Dean & Alyce) up from school. She had been crying for hours so we all asked what was wrong. She held out her left hand to show us the diamond out of her engagement ring was gone. She had been washing the kitchen ceiling and walls when she noticed it was gone. She had dumped the water down the kitchen sink. So she took an old rhinestone necklace apart and put a rhinestone in her pail with water, then poured it down the sink; and then took the trap under the sink apart to see if the rhinestone was in the trap. Half full of water it would be in the trap. More water than that it would be gone. She did this a number of times. She was sure it was gone. The next morning which was a Saturday she said she’d give us $10.00 if we found it. So all five of us kids looked all over the house. We swept and vacuumed. We couldn’t find it. Then Mom went through the vacuum cleaner dirt and found nothing. Then she went through the dirt we swept up and found nothing. She went out on the rickety back porch to get the broom and dust pan and there laid her diamond. The whole valley could hear her yell, “Oh, Thank You, Lord”. After living in Augusta for several years we were outgrowing this farm so one day I was “rubbering” on the phone and heard the Shong farm was for sale on Hwy. 27 south. I was so excited to hear this. I had all the chores done when Clayton came home from work so we could go right over to see about it. This was a farm my husband always wanted. We got over to the place and were rather disappointed, they seemed as they didn’t really want us to have it. John said they had it listed but the listing would be up in a few weeks so that way we would be able to purchase without paying the commission to the realtor. So we went home heavy hearted, thinking we didn’t have a chance. The next day, Bada called and wondered where Clayton was. I said he went to work but we’d be over when he got home. So we went and Clayton made them an offer that they were happy with. So after a few days things were rolling and papers made out. It would finally be ours. We sold ours on the hill to our neighbor, Frank Gregor, for $1,000. more than we paid – so I got $500. of new furniture with that – seeing I held out for the price. I bought a new rose colored living room set-sofa and matching chair. I also bought a studio (clicker) couch for the dining room. A new bedroom set was also one of my chosen items! And last but not least, I got an electric sewing machine. It was in a neat cabinet that looked like a desk. My, you could buy a lot for $500. in 1954! We moved into another big old house but we did have hot & cold running water, a shower and stool in the basement, such as it was. The kids went to Thompson Valley country school, they didn’t have far to walk. One evening as the twins were coming home from school, they were walking up the banks above the ditch. They found a bottle of booze (P.M. whiskey). They knew what it was because we had one like it up in the cupboard. I belonged to the homemaker’s club which would meet once a month at one of the homes. The twins weren’t going to school yet so they would have to go with me – which they absolutely hated but they were very well behaved. They usually sat right beside me and always ate all their lunch and asked for seconds, which I was very proud of. Some of the other kids (mostly girls) were regular hellions – the mother filled their plates and all they did is push it around, not eating it-wasting it which always bugged me. Clayton still worked at Drummond’s but now the kids were all old enough to help with the chores. We bought the farm across the road, 80 acres, the Pete Anderson place. We rented the house out to Marvin Solie’s. The first year we had the barn full of laying hens, we sold eggs in Osseo in the tavern and to the egg market. The next year we butchered chickens and sold them; kept only enough to fill the henhouse. We filled the small barn with cows and calves, put in a barn cleaner and had milking machines. I had a big garden and we went fishing down in our pasture where we had a trout stream. Kay did the chores at the big barn, Dean and I had the Anderson place to do the chores. This is as far as our Mom wrote about her life. So now her daughters, Kay & Alyce, (mostly Kay) are going to finish this. It will be a much shorter version!! You can tell, I’ve already added to Mom’s story. The main hired man, Kay, was graduating from high school in May of 1960. So it was time to find a hired man. Ben Thur and his wife, Carol (Sperber) were the first ones. We lived on the John Shong farm until July 1, 1960, and then Dad & Mom bought the Rodell Store & Tavern. The farm dust was no good for dad’s asthma so they were going to try something else. Mom was the third generation to own Rodell. In the one room dance hall we had our kitchen, dining area, living room, and Kay’s bedroom. Mom and Dad, Dean, Alyce, and the twins each had a bedroom in the upstairs living quarters. We lived like this until Grandpa and Grandma got their new little house in the back yard built. Mom & Dad both enjoyed tending bar. They’re a fun loving couple, so they made good bartenders and they had lots of friends. Dean and hired men run the two farms. On September 8, 1962 Dad died in Phoenix, Arizona. He was 49½ years old. He and Mom had went to visit Kay hoping that the change in climate would help improve his poor health. They arrived on Friday and Dad died the next morning. Mom’s cousin, La Moine Erdman, was keeping the tavern open while they were gone. He continued to help Mom along with Uncle Clarence, Ernie Thom, Tom Korth, and a number of other bartenders. After a few years Mom sold the farms. She enjoyed running the tavern, always ready to shake dice, play cards, dance to the jukebox or party; always tried to close the bar for Christmas Eve. Sometimes she’d have Alyce wrap a carton of cigarettes for someone who wouldn’t go home; to open while we all opened our gifts. Mom won an old ’57 Ford station wagon in a raffle for $2.00. The twins worked on it and Mom would have Don Perkovich from the Rodell Garage (old Rodell School) check to see that they had it secure when it was jacked up. They had it running in no time! They learned to be good mechanics. In 1965 Alyce married Jerry Martinson. That only lasted a short time and ended in a divorce. In 1966 Kay married David Connor. On July 27, 1967, Mom was blessed with her first grandchild, Debra Jean Connor, daughter of Kay & Dave Connor. Debbie, along with her mom-Kay, our mom-Virginia, mom’s mother-Lola and grandma’s mother-Anna Klatt, made up 5 generations. All were first born and all female. We were very proud of this. In 1968 Alyce married John Brown. Sunday, February 10, 1970, we celebrated the 50th wedding anniversary of Grandma & Grandpa Erdman. An open house was held at their church, St. Paul’s Lutheran, in honor of the occasion. In April, 1971, Dennis married Shirley Bedell and they blessed Mom with a second grandchild, Stacey Kay Bauch, on July 13, 1971. Next in July of 1971 David married Patricia Berry. After a whirlwind courtship Mom married Vernon Staatz on September 4, 1971, in a small ceremony at Our Redeemer Lutheran Church in Eau Claire, WI. She had known Vern since she was 16 years old. Vernon George Staatz was born June 28, 1919 and had 3 children: James, born June 10, 1946; Kenneth, born July 15, 1947; Sonja, born July 23, 1948. So now Mom was a stepmother and Vern became a Grandpa to Debbie & Stacey. Vern owned a home at 2505 Kay Street in Eau Claire, where Mom was very happy to have a real home again! Every Christmas Eve starting around 2 or 3 o’clock the pool table was covered with horsd’oeuvres and snacks of all kinds. Then after all the kids arrived, a huge meal, gifts and a party. We all looked forward to Christmas Eve. It’s not the same when you don’t go to Grandma’s for Christmas. Vern also had a cottage on the north side of Lake Eau Claire. They spent most weekends there and a lot of time fishing. Us kids went there a lot, also fishing, eating and just plain fun. When Mom got married, she closed the grocery store at Rodell. The small country stores were all becoming a thing of the past. She listed the tavern for sale. She was enjoying her home life in Eau Claire and wanted out of the tavern business. Mom sold Rodell to Kay in 1972. She wanted just to stay home and be a housewife and a Grandma. Vern worked swing shift at Uniroyal. So Mom made their meals all hours of the day and night. Darcy Lynn Bauch was born on April 30, 1974, the third granddaughter; second daughter of Dennis and Shirley. Anitra Rae Bauch was born on October 29, 1974, the fourth granddaughter, Dave & Patty’s first born. Heather Hughes was born on December 8, 1974, Vern’s first grandchild, daughter of Sonja and Bruce. Holly, Vern’s second grandchild, was born March 9, 1976. Andrea Renae was born on April 15, 1976, Mom’s fifth granddaughter, David & Patty’s second daughter. 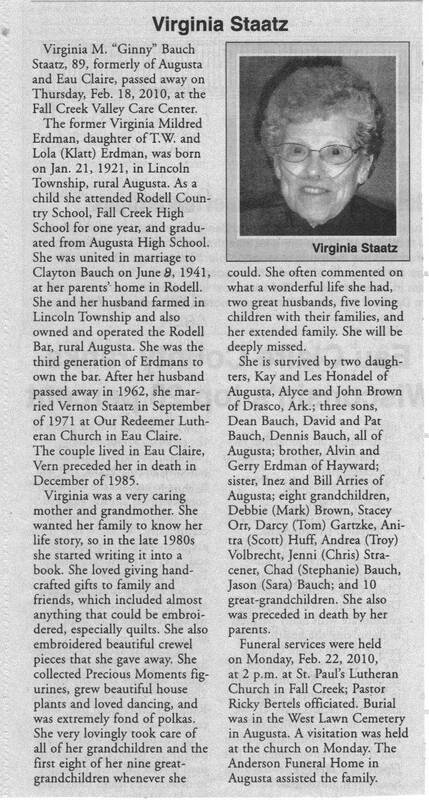 Courtney Staatz was born February 19, 1977, Vern’s third grandchild, son of Jim. Jennifer Jean Brown was born on June 7, 1977; Mom’s sixth granddaughter; Alyce and John’s daughter. 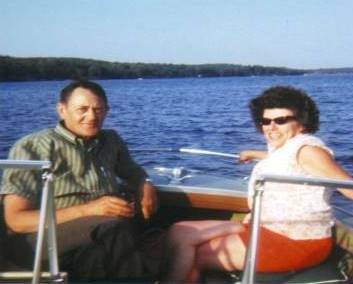 In 1976 Mom & Vern sold the cottage on the lake and bought a Winnebago in 1977. They went camping with the kids and grandkids, and still did a lot of fishing. They took Dean to Rochester in it, went to Arkansas in 1981 to visit Alyce, John & Jenni. Dave, Patty, the girls and Debbie went too. They went out to Montana a number of times. They spent a lot of time at John and Vi Erdman’s. In February, 1980, we celebrated Grandpa and Grandma Erdman’s 60th anniversary. It was at Rodell in the old grocery store. Their three children and spouses, most of the 15 grandchildren, and many great grandchildren attended along with relatives, friends, and neighbors were present. One year for Christmas us kids bought Mom and Vern an aquarium. They enjoyed many hours watching their fish. Vern loved watching “Herman”, the algae eater! Vern retired from Uniroyal in 1980. They enjoyed retirement in the Winnebago, if no place else to go, they’d just go bar hopping. Then their lives really changed, Vern had a stroke. In April, 1981, after the stroke, he got pneumonia and went down hill every month after that! Mom took care of him at home for as long as she could. He was at the V.A. hospital in Tomah for a while and then at The Clairemont Nursing Home, where he passed away December 18, 1985. He was only 66 years old. He was a wonderful man. Mom, us kids, and grandkids loved him very much, we all still miss him. Mom continued to live in their house at 2505 Kay Street in Eau Claire. Dennis got a divorce from Shirley and in 1980 he married Debbie Sell. On June 11, 1981, Mom was blessed with a grandson, Chad Clayton Bauch. Then came another boy on September 12, 1983, Jason David. Mom enjoyed all her kids and grandkids very much! Another thing Mom enjoyed was dancing. She loved old time music, the polka was her favorite! I can remember three trips Mom went on. She went to Hawaii, I think to 3 islands; went on a trip to Florida-Disneyworld, Space Center, and lots of other places. She went on a trip to California, I know her and Phyllis Strauch went to a Green Bay Packer game out there. And of course, she went to Arkansas a number of times to visit Alyce, John and Jenni. She went there in the Winnebago, car, and airplane. In 1986 when Kay married Les Honadel, Mom had such a good time at their wedding dance that she fell and broke her wrist. A couple of years before that Mom pulled out in front of an oncoming car and got her collarbone broke. Mom had many hobbies over the years. First, after she moved to Eau Claire, she got into plants. She made one of the bedrooms into a plant room, complete with grow lights. She had lots of cactus. In the summertime she’d put them all out on their deck. I can remember a grandma and grandpa cactus, he had a big beard. I can remember one that had a beautiful large flower that would only open after dark. Vern always said there were plants everywhere, “Can’t even step out of the shower without hitting your head on a plant”. Next she got into ceramics, went to a class and made us all some real neat things which we treasure today. She made lawn ornaments, cookie jars, flower pots, geese, snowmen, Christmas trees, Christmas ornaments, figurines and numerous other neat things. In 1983 she started collecting Precious Moments. She started with the four seasons. But never could find “Spring”. Next she bought the twelve months. She bought a few but most of them she got from us kids and grandkids. We always knew what we could buy her for her birthday, Mother’s Day, and Christmas. Next, she started making felt appliqué Christmas stockings for everyone. She embroidered each name on the stockings. I counted 36 that she made. She also made tree skirts out of the appliqué kits. There’s lots of sequins, detail, and stitches in each one. Plus, all the hours of labor and love put into them. She made a quilt which she embroidered the 50 states on. It’s beautiful and she worked on that for years. She gave it to Alyce, which she is using in her “Rodell” room! Embroidered crewel work pictures is what she made next. She made one for each one of us kids. One of them is “Footprints in the Sand”. There’s lots of stitches in all those words. The other four are scenery pictures. She always loved to embroidery. She embroidered “The Good Shepherd” when she was in high school and Grandpa made a frame to put it in. She gave that one to Dave. Our Mom spent lots and lots of hours doing crossword puzzles. I always thought that’s what kept her mind so sharp! Saturn opened up a dealership in Eau Claire in 1993. Mom bought the first new little red Saturn that was sold there. While she lived in Eau Claire she drove to Augusta nearly every Friday to have her hair done. Pat, our sister-in-law, has the Shear Delight and done Mom’s hair for about 40 years. Of course, when Mom went to Augusta, she’d stop at Rodell. She came to see Kay, Dean, Debbie, or whoever was around. Also, would have a beer or a brandy and water. She’d go next door to visit with Grandpa and Grandma too! Mom loved her whole family, but her great grandchildren were really special. Josh was born October 9, 1990; being the first one made him very special. Again we had 5 generations which we were very proud of. Great Grandma baby sat him every chance she could. She’d pull him around the block in the little red wagon she bought for him. She’d make special noon lunches for them, which was good because then she’d eat one good meal a day and had someone to eat with! When he got older he’d ride his trike and Great Grandma would walk along side him. When Josh got older he always wanted to do “big work”. He wouldn’t play with the neighbor’s grandkids because he had to water flowers. He planted plants and shrubs for her. The shrubs are still at Wunderhaven. Next came Jake on August 19, 1993, and again we had 5 generations. Great Grandma couldn’t handle two so Josh went to pre-school and Jake stayed at Mom’s but not nearly as much. Mom’s arthritis was getting worse so Jake went to daycare. On a Monday afternoon in 1993 Grandma Erdman passed away in her chair, November 29th was the day she left us. Grandpa wasn’t able to live by himself so he went to the Fall Creek Valley Nursing Home. He died there six months later on May 17, 1994. They were married for 73 years. They had a wonderful Christian life together. Next came Adler on January 11, 1999, but he always lived away from here. Taylor came next on April 21, 1999, Mom loved babysitting him, he was very special. In 1999 we talked Mom into selling her house and moving to an apartment. With her rheumatoid arthritis, going up and down stairs to do the laundry had to come to an end. She moved into a brand new four-plex in Fall Creek. Wunderhaven was right across the road from her church. She had an auction to downsize to her apartment. After four boys, Autumn came along on January 22, 2002, the day after Mom’s birthday. Mom now had someone born in January to hand down her birthstone ring to. Her Grandma Erdman bought her this ring. Mom babysat her a few times and also loved every minute of it. February 19, 2003, Carson was born; another adorable grandson. Great Grandma babysat him a few times too. Kyra, born on September 4, 2004 and Clayton, born July 17, 2006, also were babysat a few times by Mom. Everyone was very special. When Griffin was born October 5, 2008, Mom’s babysitting days were over. Mom lived at Wunderhaven until August 30, 2008. Then we moved her to Augusta. With her COPD it was time to downsize again. She was now on oxygen 24-7. St. Paul’s Apartments was perfect for her. It was small, only one bedroom, and she knew most of the ladies that lived there. She didn’t even have to go outside to get her mail. Her apartment in Augusta only lasted until October 23rd when Kay took Mom to E.R. She never came back to her apartment again. She had pneumonia, left Sacred Heart and went to the Fall Creek Valley Care Center for rehab. She then got pneumonia again so back to Sacred Heart and back to Fall Creek to stay for good. January of 2009 Mom signed herself in the Fall Creek Valley Care Center for the rest of her life. We cleaned out her apartment and got rid of everything except her personal belongings. Pat Bauch, our sister-in-law faithfully does her hair every week. Mom cares what she looks like, likes to be clean and have on nice clothing. Not once has she ever asked to go home. She loves it there, complains about the food but that’s Mom! Everyone at the nursing home wanted to see Griffin when they came to visit because of that full head of hair! All the granddaughters are very good about bringing the great grandkids to visit Mom; and they keep her bulletin board full of recent pictures. She participated in all the activities, Bingo is her favorite, probably because she wins a lot! In her room she has a large shelf with all her winnings, small stuffed animals mostly. Mom’s best friend at the home is Jean Weber. She has been since day one! The old bartenders are hanging together, Ada Rucks included. On January 21, 2010, I had an 89th birthday party for Mom. She was exceptionally good that afternoon. She’s always ready for a party! Her favorite saying has always been, “Let’s have a party”. Les and I went to Jean Weber’s birthday party at the Care Center on Saturday, February 6th. We noticed something was wrong with Mom. On Monday they brought the van down for her to have a chest x-ray. They found she had pneumonia again. She had some good days where she was better and would go to the dining room for activities and then she gradually got worse. Mom passed away at 8:30 a.m. on Thursday, February 18, 2010. Her pastor, Rev. Larry Borgelt, was with her when she left us. Arlene Anderson, an activity director, was reading Mom her Portals of Prayer when Pastor Borgelt came. She is in a much better place and she’s with Dad, Vern, Grandma, and Grandpa; also, lots of other family and friends. Contributed by Connie Krenz Brown Published with permission -June 2010.